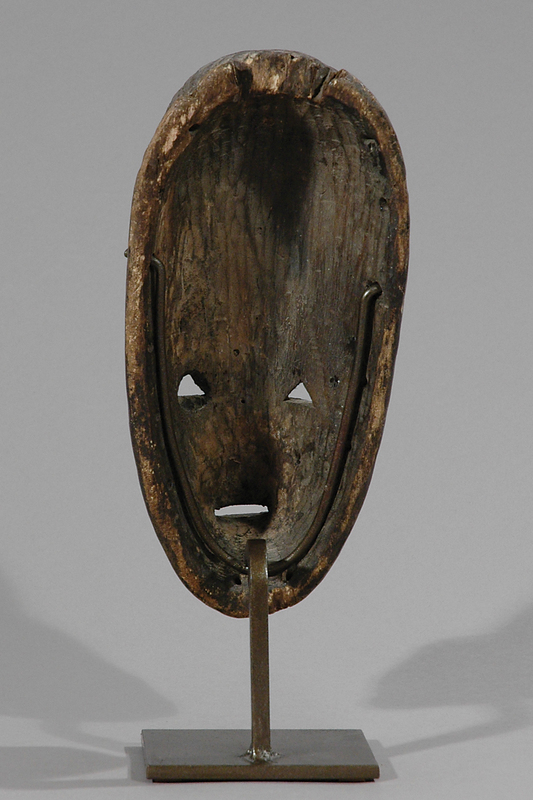 This extraordinary mask is sculpted in wood, and it has a fine old patina on the face that makes it looks like a stone sculpture, with traces of polychromy (white on the closed eyes and the cheeks, red on the chin). 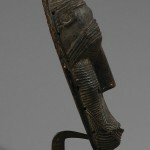 The overall piece is very stylized and symbolic, closed eyes, stone-looking patina, slightly open mouth, fine scarification refering to lineage and/or nobility. The overall piece is finely and carefully carved (as visible on the back), remarkably balanced and with an inner look that is evoking eternal sleep or spirits. 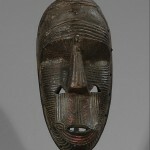 Many figures and masks of the Urhobo culture are indeed dedicated to spirits of water and earth called edjo or emedjo. 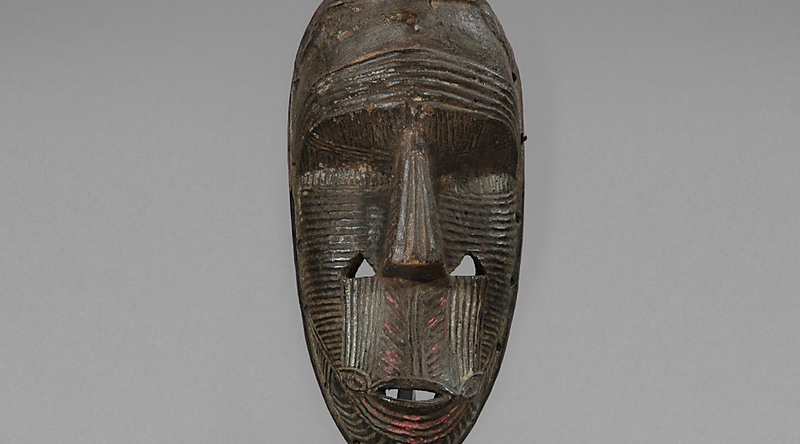 Water spirit are particularly important for these ethny leaving at the cross road of the Benue and the Niger Rivers. But the exact use and origin of this piece remains partly mysterious. 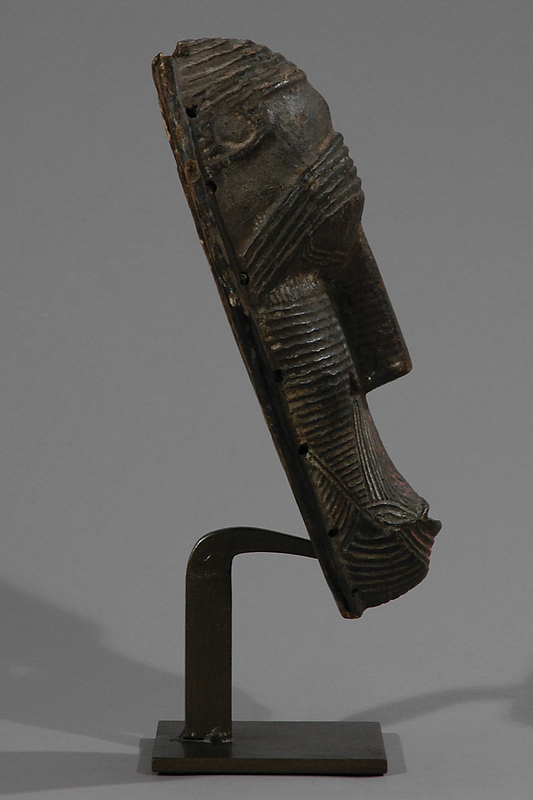 Urhobo art is rare and delicate, especially old pieces and has integrated influence by several neighbours like igbo, Ijo or Itsekeri. 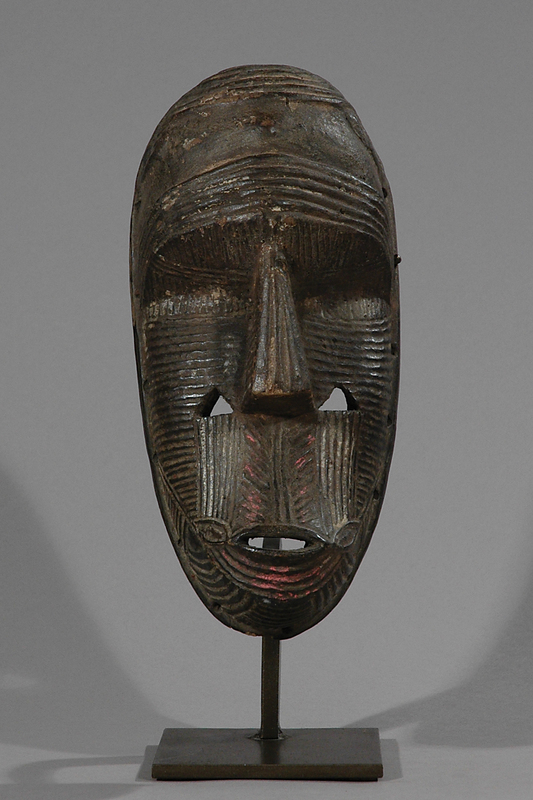 This type of mask is used in ceremonies honoring the water spirit ohworhu, common to the southern Urhobo communities. Once in a decade the people of Evwreni celebrate ohworhu. On two days of masquerade dancing and during preliminary rites spaced throughout the previous months, they honor the spirits responsible for the well-being of the community. 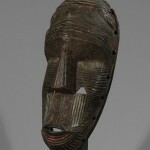 Works of art in wood and palm raffia come to express deep-seated beliefs in water-and-forest-based spiritual forces. 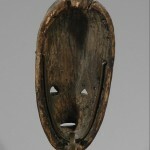 Age: Estimated early 20th Century. Provenance: From an important collection in Paris, that wishes to remain anonymous. 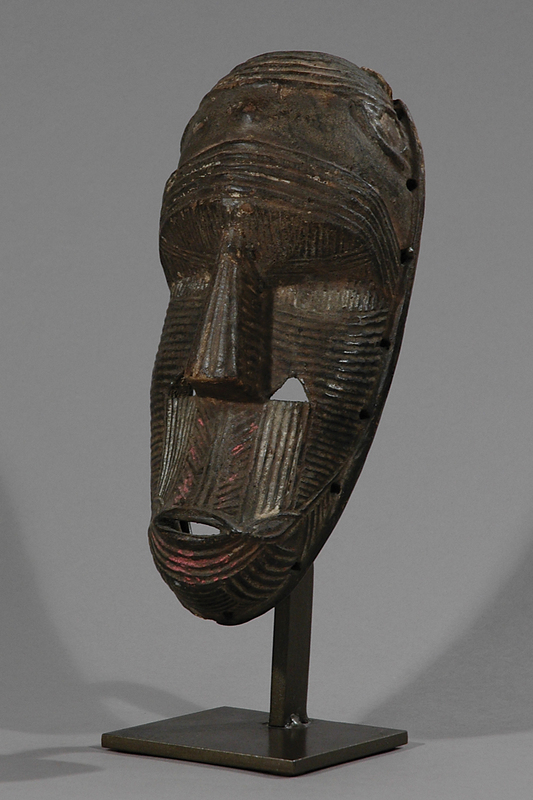 It was acquired in the 1980s in Lome from the field (Many old Nigerian objects were acquired at this time in the world collections as it is explained by the recent book on the Nigerian Art in 2013). Then by a Toulouse private collector in 2007 who sold it to, Missis Gondebeau from which it was acquired by a French private collector.